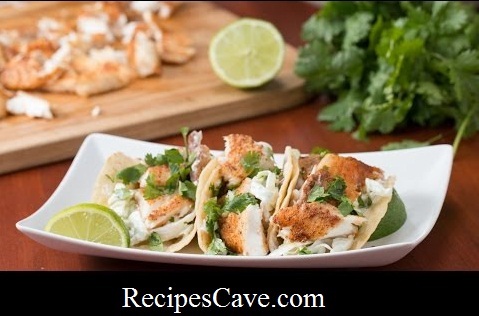 Easy Fish Tacos Recipe - How to cook Easy Fish Tacos Recipe follow these simple steps. 1. In a large bowl, combine green cabbage, red onion, sour cream, lime juice, and salt. Chill until ready to serve. 2. In a bowl, mix cayenne, garlic powder, cumin, salt, and pepper. Season each tilapia fillet on both sides with the seasoning mix. 3. Over medium-high heat, cook 2 fillets at a time for 8 minutes, flipping halfway. Repeat for the remaining fillets. 4. Using a fork, break apart the fillets into bite-size pieces. 5. Right before serving, heat the corn tortillas in the pan over high heat. Remove from the pan and assemble the tacos with the cabbage slaw and tilapia. 6. Garnish with cilantro and lime juice.